Vegan Cookie Recipes That Even Non-Vegans Will Love! The number of people practicing a vegan lifestyle has grown quite a lot over the last few years, especially as people have become more and more conscious about their diets and where their food is coming from. But just because this diet doesn’t allow for milk, eggs, and other dairy products, it doesn’t mean delicious baked goods have to be sworn off forever. In fact, there are lots of substitutes available for these animal-derived ingredients, allowing vegans to enjoy the same (dairy-free) tasty treats as their non-vegan friends. The best part? There’s no sacrifice in flavor, and the end result is just a delicious as the traditional recipes! Butter - Used to add flavor and richness. Butter can give baked goods a more spongy and dense texture, and it also assists in even rising. It’s also very easy to substitute with other fats and oils, such as olive oil, untoasted sesame oil, unrefined coconut oil, and canola oil. Vegan shortening can also be purchased at many grocery stores, and of course, there’s good ol’ margarine for that dairy-free buttery taste. Eggs - Eggs function as both a binding and leavening agent, and they can also add moisture to a recipe. To substitute eggs, you can use an egg substitute (available at the supermarket), or ground flaxseeds for a healthier addition. One tablespoon of ground flaxseed mixed with 3 tablespoons of water is equivalent to 1 egg. Other subs include mashed banana, applesauce, soy yogurt and pureed black beans (yes, really!). Milk and cream - Milk and cream are responsible for flavor, richness, and texture in baked goods. For vegan recipes, sub out milk or cream with soy, nut, or coconut-based products that are readily available at the grocery store. The classic favorite with a vegan twist! This is a simple and delicious recipe that both vegans and non-vegans will gobble up! Makes about 12-15 cookies. Cream together the coconut oil and the brown sugar, then add in the almond milk and vanilla extract. The mixture will be pretty liquid-y at this point. Mix the dry ingredients (flour, baking soda, baking powder, and salt) in a separate bowl. Mix the dry ingredients into the wet ingredients, then fold in the chocolate chips. Roll the dough into tablespoon-sized balls and place them on your cookie sheet. Gently press each ball with the palm of your hand to slightly flatten. These tasty gems are vegan and gluten-free, and they’re super easy to make! All you need is five ingredients and a food processor, and you’ll be munching on these yummy, wholesome cookies in no time! Makes 2 dozen. Add dates to food processor and pulse until they are reduced to small bits. Add the banana and almond or peanut butter, mixing until combined. Add the almond meal and oats, pulsing until combined and a loose dough is formed. Transfer the dough into a mixing bowl. If it’s too wet and sticky, mix in another tablespoon of almond meal and/or oats until the consistency is such that you can form the dough into cookies. Add any of the optional mix-ins now. Chill the dough for 10 minutes in the refrigerator. Remove the dough from the fridge, then shape into tablespoon-sized discs and place on a parchment-lined baking sheet. Bake for 15-18 minutes or until golden brown, and serve immediately. My Grandma - the best baker I know! My Grandma Joanne is the best baker I know, hands down! I like to think that I inherited some of my baking ability from her. She can take the most simple ingredients and turn them into tasty treasures that fit in at a church bake sale, fancy tea party or serve as family birthday cookies! Here I will share one of her oldest recipes, one that brings back memories of baking up treats to serve the masses of children that gathered at her home. For many years, Grandma would make wedding cakes for her family members and friends. We could always count on her to have a bag of frosting in the fridge when we came over to visit! Grandma would sit us down at the table with a package of graham crackers and a pastry bag of buttercream, then let us go to town! Sometimes we would make cute decorations, other times we would just glob the frosting in the middle of a cracker sandwich and enjoy! Many times when we visited, Grandma's cookie jar would contain Cowboy Cookies. Grandma once told us the story of how she had found this recipe when her oldest boys (twins) were babies. As they grew up, they loved to help her stir up the dough. All of her kids enjoyed the taste of the cookies with a tall glass of milk, so this recipe became an old standby as Grandma raised her 16 children. These gourmet cookies became such a standard that my dad (her oldest) could easily recite the recipe from memory at a very young age! When I asked Grandma for a copy of this recipe, she could barely read the writing on the index card because it had been pulled out so often. I wanted to share this recipe with all of you to pay tribute to my Grandma and because, well the cookies are so darn good! Before we get started... - Get your ingredients ready! Cut lard into the sugars with a pastry cutter. Mix in 1 egg. Combine the remaining dry ingredients (may be easiest to do with your hands). Drop by the spoonful onto a cookie sheet. For smaller cookies, just make smaller drops of dough. Then adjust bake time accordingly. For average sized cookies, bake for 8-10 minutes at 350 degrees. Step 1 - Mix Ingredients! Step 2 - Spoon onto baking sheet! See How It's Done - This is much like my grandma's recipe! Have You Seen The Giant Cupcake Cake? There is a cake mold that looks like a giant cupcake. The first time I saw a giant cupcake, I thought it was the neatest cake ever. I've seen them for birthdays, baby showers and bridal showers. For a really fun look you can decorate the giant cupcake just the way you decorate a regular sized cupcake. It's sure to be the hit of the party! Celebrate in a big way by giving someone a cupcake gift surprise! If you're looking to create a unique cake for you next birthday or special event, look no further! Find all the supplies and decorating ideas right here. 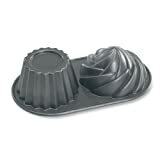 A giant cupcake pan consists of 2 molds - the bottom of the cupcake and the top. Before constructing your giant cupcake, a good idea is to put a layer of frosting between each half and allow it to set so you are less likely to have slippage during frosting the outside (and who doesn't love a frosting center?). Finished cupcake measurements are approximately 7-1/4 by 7-1/2 inches. Some of my favorite Giant Cake Creations! Remember this is giant cupcake is supposed to look like a regular cupcake only giant sized. I think it looks best with frosted cupcake-style with giant sized add ons like jelly beans, disc candies or large sized sprinkles. Be creative! 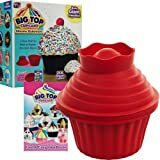 Add a giant cupcake to a regular cake for an amazing creation! Bake a regular 9 inch round cake and then decorate a giant cupcake to place on top. Oh those delicious cupcakes! I have never met a cupcake I didn't like. Great for any occasion, cupcakes can be for birthdays, school parties, weddings, picnics, baby showers, the list goes on and on. Cupcakes can be even be a simple dessert after dinner or as an after school snack. Cookies are nice, but Cupcakes have more pizazz! You can dress them up with fancy icing or even ganache, and add sprinkles, candies or little decorative toppers, and the inside can be laced with chocolate chips or caramel or fancy fillings, or you can dress them down with simple icing and basic flavored cake mix. However you make them they are wonderful tasty treats everyone loves. Cupcakes are great for bake sales and fundraisers too. No one will walk by your table at the bake sale without stopping to buy one of these. They just make people smile! Cupcakes don't have to have a theme, but if you need one, here are some suggestions. Wedding - put cupcakes at each place setting in a cupcake favor box. Many cake companies offer cupcakes as part of the wedding cake order - saves on cutting! Valentines Day- form individual cupcakes into a large heart, or decorate with red sprinkles. Christmas - make snowman faces on them or make a santa with a coconut beard. For quick and easy, frost then decorate with Christmas candy. Halloween - use black licorice to make whiskers on cat faces, wafer cookies as tombstones or marshmallows as ghosts. Thanksgiving - decorate as turkeys with wafer cookie wings and candy corn feathers. Cupcakes are very easy to fill. Choose your favorite filling and put it into a decorating bag. Use the regular tip that would be used for large writing. On the top of the cupcake poke the tip about three fourths of the way into the center of the cupcake. Squeeze the tube of filling and pull away from the cupcake. Do not overfill the cupcake, you only want about 1-2 tablespoons inside. Don't let the filling ooze out of the cupcake. Gently scrape off any filling that is on the outside of the cupcake before you put icing on it. If your filling is thick or lumpy, another way to fill a cupcake is to cut a small circular section out of the top of your cupcake - about 1 - 1 1/2 inches deep. Carefully remove that section, fill with desired filling and then replace the cut out section (trimming if necessary) then frost to cover up the patch. The classic combination comes together in a cupcake! (1) Preheat oven to 350 degrees. If desired, line cupcake pans with paper liners. You may also spray cupcake pan with a butter and flour combination spray that can be found in your local grocery store. (2) Combine all ingredients in a large mixing bowl. Mix at low speed for 30 seconds while scraping bowl. Mix at high speed for 3 minutes, scraping bowl every minute. (3) Spoon cupcake batter into liners until they are 1/2 to 2/3 full. You should have enough batter for 24-36 cupcakes. (4) Bake for 20 to 25 minutes or until toothpick inserted in center comes out clean. (5) Cool 10 minutes in pans then move to wire rack to cool completely. (6) For Frosting, Combine 1/2 cup softened butter with 1 cup creamy peanut butter (crunchy can also be used). Add 2 cups powdered sugar (sifted after measuring), and up to 1/4 cup heavy cream until you get the consistency you want. For an extra special touch you can top with a mini peanut butter cup! For this and other cupcake recipes visit this link. Click the links below for Free Recipes! Decadent and fancy cupcakes galore! A great list of recipes including special holiday cupcakes. Lots of cupcake recipes with user reviews. Cupcakes and Babies - What gift or favor could be sweeter? Cupcake Favors for your Cupcake Party! Find these adorable cupcake favors at Wedding Favors Unlimited. Perfect for a Sweet 16 party, Wedding, Bridal Shower or Birthday Party! It's amazing how throwing a few ingredients together and adding some seasoning can create such a taste sensation! Below I've listed my top 10 favorite snack mixes. From sweet to savory - gourmet popcorn to savory nuts, you're sure to find something you love! Snack mixes are also a great gift for long-distance friends and relatives. Send some along in a nice serving bowl that they can use again and again. Find your favorite recipe and fill up your snack baskets for birthday parties, showers, weddings, graduation parties . . . basically any event! Just make sure to make plenty - as people will keep coming back for more! A wonderful combination of sweet and salty! My cousin had this set out at her son's graduation party. We couldn't keep our hands out of it! Fill bowls on your event tables, or include a bag as part of your graduation favors. 1. In a large bowl mix all dry ingredients (minus the M&M's). 2. Bring sugar, butter and syrup to a boil. 3. Pour caramel mixture over the mix and stir. 4. Spread in two 9x13 cake pans. 5. Bake at 350 for 8 minutes, stir and bake another 8 minutes. 6. Pour in brown paper bag to cool, mixing every so often to keep from clumping together. 7. Once totally cool, add M&M's. 1. Line 3 baking sheets with waxed paper or parchment. Set aside. 2. In a large bowl, combine mini pretzels, toasted oat cereal, crispy corn cereal squares, salted peanuts, and candy-coated chocolate pieces. Set aside. 3. In a microwave-safe bowl, heat chips and oil on medium-high for 2 minutes, stirring once. Microwave on high for 10 seconds; stir until smooth. Pour over cereal mixture and mix well. 4. Spread onto prepared baking sheets. Cool; break apart. Store in an airtight container. 1. In a saucepan or microwave-safe bowl, combine the first five ingredients; heat until the butter is melted. Stir until the sugar is dissolved. 2. In a large bowl, combine cereal, oats and nuts. Drizzle with butter mixture and mix well. Place in a greased 15-in. x 10-in. x 1-in. baking pan. Bake, uncovered, at 275 degrees F for 45 minutes, stirring every 15 minutes. Cool for 15 minutes, stirring occasionally. Stir in cranberries and chocolate-covered raisins. Store in an airtight container. 1. In a large bowl, combine the first six ingredients. In another bowl, combine the butter, syrup, Worcestershire sauce, Cajun seasoning and cayenne; pour over cereal mixture and toss to coat. 2. Transfer to an ungreased 15-in. x 10-in. x 1-in. baking pan. Bake, uncovered, at 250 degrees F for 1 hour, stirring every 15 minutes. 1. Preheat oven to 250 degrees F (120 degrees C). Grease one baking sheet. 2. In a mixing bowl, whip together the egg white and water until frothy. In a separate bowl, mix together sugar, salt, and cinnamon. 3. Add pecans to egg whites, stir to coat the nuts evenly. Remove the nuts, and toss them in the sugar mixture until coated. Spread the nuts out on the prepared baking sheet. 4. Bake at 250 degrees F (120 degrees C) for 1 hour. Stir every 15 minutes. 1. Preheat oven to 250 degrees F (120 degrees C). Lightly grease a large roasting pan. 2. In a large bowl, mix crispy corn and rice cereal, slivered almonds and toasted, chopped pecans. 3. In a medium saucepan over medium heat, melt the butter and mix with dark corn syrup and light brown sugar. Pour the mixture over the crispy corn and rice cereal mixture. Stir and shake to coat all the nuts and cereal. 4. Pour the coated mixture into the prepared roasting pan. Stirring approximately every 15 minutes, cook 1 hour in the preheated oven. Cool on wax paper, and store in airtight containers. Just like the kind you get at carnivals! 1. Heat the vegetable oil and 3 popcorn kernels in a large pot over medium heat. When all 3 kernels pop, the oil is ready. 3. Remove the pot from the heat and continue to shake for a few minutes until the popping has stopped. Pour into a large bowl, and allow to cool, stirring occasionally to break up large clumps. *Optional - If you'd like a little salt with your sweet, sprinkle salt after pouring into a large bowl. Mix all ingredients in a large garbage bag. Bake at 250 degrees for 45 minutes, stirring every 15 minutes. We use a huge roaster pan but you can also spread out the snack mix on cookie sheets (which shortens baking time). Store in ziploc bags, makes a huge batch (about 4 gallon size ziploc bags). Quick and Simple yet Tasty! Microwave first 3 ingredients together until they reach boiling. Pour 1 cup dry roasted peanuts and 1 box Crispix into a paper bag and pour sugar/syrup mix over it. Mix together, close up paper bag and microwave for 2 minutes. Shake well and microwave for another 2 minutes. Shake well and pour out over wax paper to let it cool. Store in ziploc bags to preserve freshness.